Irel Clark is a professor's assistant whose latest find is the "Holy Grail" for member of his profession—literally! But when it turns out that some decidedly unholy individuals are also after the blood of Christ, Irel must drink from the chrism bottle he's recovered to save his own life. Immortality leaves something to be desired, though, when undead cannibals walk the earth in constant need of human flesh, and Irel's newly immortal body is nothing short of an all-you-can-eat buffet! 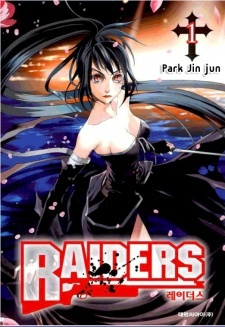 Raiders was published in English by Yen Press from December 15, 2009 to December 11, 2012, as well as in eBook format from February 10, 2012 to April 23, 2013.